Father’s Day is right around the corner, which means you will need to start thinking about cool and thoughtful gifts for your dad. There are some gifts that are timeless, such as a nice tie or a few rounds of golf. However, plants are an excellent way to spruce up your dad’s office or mancave, and we all know that like moms, dads appreciate getting flowers delivered too! So try something new this year and surprise the big guy! Many dads love to be out on the water, whether they’re hanging by the beach with a frosty beverage or they’re setting sail into the sunset. It’s summer, so there’s is no better time to embrace a nautical theme! Try out Teleflora’s Anchors Aweigh Bouquet, a colorful arrangement that includes its very own collectible sailboat and flag for Dad. This is a vibrant collection of flowers paints a classic picture against the sea blue backdrop of the sailboat and flag. It’s the perfect gift for dads who call the beach their second home. Who doesn’t love the vintage glamour of a ’65 Mustang? 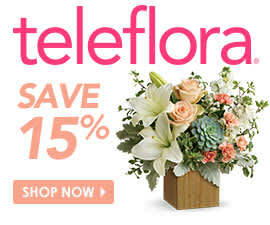 Let your dad relive the days of muscle cars and cruising down the strip with Teleflora’s ’65 Ford Mustang Bouquet. He’ll be able to keep the Mustang car as a collectible, so he’ll remember this Father’s Day for years to come. With dynamic blooms like red miniature carnations, yellow button spray chrysanthemums and white daisy spray chrysanthemums, this arrangement will brighten up any office. If you want your dad to relax and embrace inner peace this Father’s Day, then Teleflora’s Peaceful Zen Garden arrangement is a perfect pairing. These plants take on more of a minimalist vibe, so if your dad isn’t a big fan of flowers, this could be a huge hit. As an added bonus, succulent plants and bamboo are low-maintenance, making this arrangement a great gift for dads who might have trouble keeping up with a watering schedule. A lot of Dads out there relish in the idea of heading out to the ballgame this summer. Luckily, you can bring the sights and tastes of the stadium with Teleflora’s Take Me Out to the Ballgame Basket right into your dad’s office. Peanuts and Cracker Jacks are of course included, but your dad can also enjoy a couple bottles of root beer, pretzels, some pistachios, and a baseball. Be sure to thank your dad this Father’s Day by picking up one of these beautiful arrangements. Whether your dad is into cars, baseball or the beach, our arrangements have you covered! These arrangements are cool. Loved all of them. Simple and unique. Lovely idea! You can also decorate your dad’s office with pen holders, ashtray, photo frames or a office set. These are best ideas to gift your dad this father’s day.